Graze is a mini-snack subscription box that sends a customized selection of treats weekly, bi-weekly, or monthly. Graze offers over 100 different snacks that you can rate online, which, over time, helps tailor your subscription to your particular snacking preferences. Some subscribers spend time choosing preferences, noting which options they want to try, think they would like, or “trash” and prefer not to receive. Each Graze box may look completely different! For subscribers with food sensitivities, it’s easy to “trash” snacks that contain gluten, dairy, or any other specific ingredient; however, Graze snacks are produced in a facility with nuts, wheat, milk, and many other foods that might not make this subscription a good fit for anyone with severe food allergies. Boxes are shipped via USPS and are conveniently designed to fit in most standard mailboxes. Did you know you can try Graze for FREE? Just follow this link, and don’t forget to check out other subscription boxes you can try for free! This review is of the 8-Snack, $13.99 a month, box. The Cost: $13.99 per box for an 8-snack box or $25 per box for a sharing box that contains 5 bags of snacks (about 20 servings). Shipping is included. COUPON: Get your first 4-snack box free (only pay $1 shipping) by clicking this link. No coupon required. The Products: Healthy snacks tailored to your specifications. Ships to: U.S. (and U.K. via the Graze UK site). The pamphlet in this month’s box has some general information about the nutritional benefits of the snacks in my box this month. And on the back is all the nutritional information and ingredients of the snacks included in the box if you want specific deets on our snacks. This sub does nut mixes really well, I just prefer their more creative options. This blend of walnuts, hazelnuts, and almonds was good, but not super exciting. I mixed in some chocolate pieces because I am a sugar addict. This is a solid nut mix and great for afternoon crazings. The blend of Brazil nuts, almonds, pecans, and peanuts pack in 7 grams of protein which make them a great little treat to tide you over between meals. I tend to appreciate the more creative snacks that can come in the sub though. I have had these before and love these chewy bananas! The cinnamon honey almonds are a wonderful compliment to them as well as the pecans and raisins. This is a great snack for those of us with a crazy sweet tooth. These were too spicy for me, but I am a big baby when it comes to anything hot. I did love the sweet nuts though and just ate around those chili lime cashews. I imagine if you like spice you will adore this snack because the creative mix of limes, chili, and honey sounds wonderful! I have never met a flapjack I didn’t love. I wish they had a flapjack only box! This one is a tasty apple cinnamon flavor and I loved its dense yet soft texture. I usually enjoy these right away, though once I did hold off long enough to crumble one into some yogurt. I highly recommend this. This was another winner for me. I love dates and almonds and the chocolate covered orange pieces really set those milder flavors off well. This one also had a ton of texture happening that I couldn’t get enough of. I have never gotten two of the same snack in the box in the same month, so I was both surprised and disappointed to get two of these snacks this month. I have had it before and I do not like the spicy chickpeas at all. I didn’t let the beet chips and sunflower seeds go to waste though, eating around those peas. Verdict: Graze is usually much more enjoyable than this month for me. The duplicate of a snack I don’t like combined with the pretty ordinary nut mixes and another spicy selection just wasn’t my jam this time. I did love the flapjack, the cinnamon banana nuts, and the orange cacao treat though! I get this box pretty frequently, and this is the first box I have really just not been into. I know next month will have a new selection of treats I will probably fall head over heels for, as this sub is truly one I look forward to each month. Can you still get this box if you sign up today? Graze sends snacks based on your flavor profile, so your box will look completely different than mine! 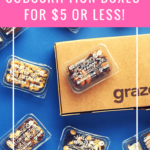 Coupon – Get your first Graze four snack sampler box FREE (only pay $1 shipping) by clicking this link. No coupon required! Value Breakdown: At $13.99 for this 8-snack box, you are paying $1.75 per snack. 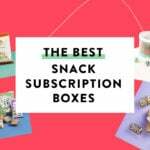 Check out all of our Graze reviews, and visit the Food Subscription Box Directory to learn about other snack subscription boxes! Do you have a favorite Graze snack?